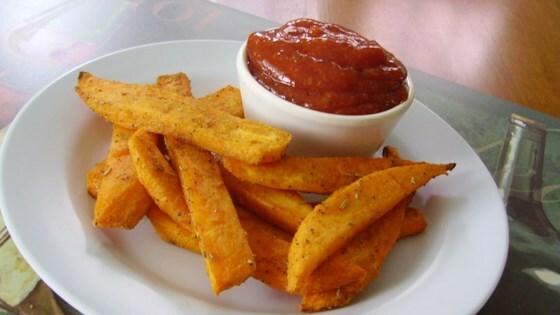 "Slightly sweet and very filling, these sweet potato fries are a favorite with our family!" If you substitute dried rosemary for fresh, decrease the amount to about 1 teaspoon, or to taste. Very good recipe. Baked in a glass baking tray and came out very good. Not greasy and very tasty. Will make this a keeper. These were pretty good, but next time, I'll cut the potatoes thicker (personal preference) and probably add a little more fresh rosemary.